Enayatollah Shahidi, MD, born in 1967, is a licensed Medical Doctor and Cognitive-Behavioral Psychotherapist residing in Tehran-Iran. He is a well-recognized author, translator, lecturer, researcher, and therapist in the fields of hypnotherapy and CBT. He has been practicing hypnotherapy since 1994 and teaching clinical hypnosis to the professionals since 2001 and has been a faculty member of the most important international congresses of hypnosis since 2012. He is currently a BOD member and Co-chair of Education and Training Committee of the International Society of Hypnosis (ISH). He has also been elected as the Secretary-Treasurer of ISH for the years 2018 to 2021. 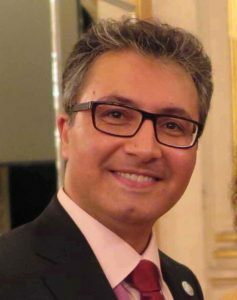 He has been Vice-president, Treasurer, and chair of International Affairs Committee of the Iranian Scientific Society of Clinical Hypnosis (ISSCH) since 2010 and the co-organizer of five successful International Hypnosis Congresses in Iran since 2012.